As more patients use medical marijuana, health systems must develop strategies and policies for managing its use. Pharmacists, as the medication experts, are in an ideal position to take a leadership role in these pursuits. To this end, pharmacists must educate themselves on the risks and benefits of medical marijuana, its legal/regulatory status, and take an active role in educating patients. 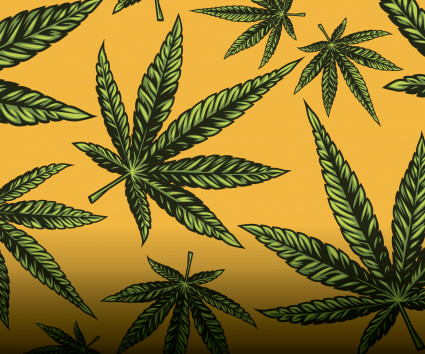 Marijuana use has many ostensible benefits, and while it is effective for some patients, it is not appropriate for everyone and must be used cautiously. Cannabis is not regulated as an FDA-approved product; considering this lack of regulation and its classification as an illegal substance on the federal level, significant challenges must be taken into account when recommending its use. 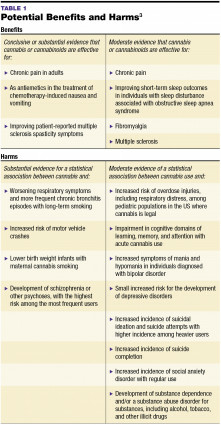 Several barriers exist in conducting medical marijuana use research. The knowledge gap surrounding the use of cannabis and cannabinoid products remains significant. Pharmacists who work in dispensaries in some states report relying on educated guesses and advice from colleagues regarding which products, strains, and formulations to recommend to patients.11 It is challenging to locate data on cannabis within traditional pharmacy resources, which makes it difficult to characterize potential drug-drug interactions. Without clear evidence, it is a challenge for pharmacists and providers to accurately counsel their patients and optimize therapy for safe and efficacious cannabis use. Hospitals are potentially at risk of being in violation of federal law if they allow medical marijuana use in their institutions. Since cannabis is illegal under federal law, hospitals accredited through the Centers for Medicare and Medicaid Services could be cited for violations, lose federal funding, and receive fines in the event of permitted cannabis use. Moreover, because marijuana is not an FDA-approved medication, providers are not permitted to prescribe or provide it to patients. The Joint Commission Medication Management Standards provide recommendations on the safety of medications brought into health care facilities by patients.17 This resource provides some guidance on treating medical marijuana as a home medication. In states without tightly regulated medical marijuana dispensaries, concern exists regarding how to accurately identify the product for labeling when it is brought into a health care facility. As the medication experts, pharmacists are uniquely suited to discuss marijuana use with patients and help them navigate the complex landscape of its use. Unfortunately, most pharmacy schools do not provide formal education on this topic. Pharmacists must keep abreast of the varying state laws, as each state can dictate who is eligible to receive medical marijuana, who can recommend or dispense cannabis, and in what dosage form and quantity. Patients should receive education on various dosage forms, anticipated side effects, possible drug interactions, safe use, and safe storage and handling. As more patients use cannabis, it is important for pharmacists to be on the forefront of patient education to ensure safe and appropriate use. 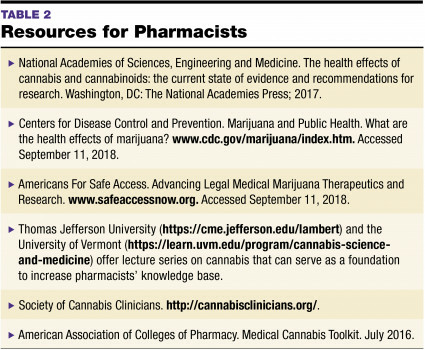 Thomas Jefferson University (https://cme.jefferson.edu/lambert) and the University of Vermont (https://learn.uvm.edu/program/cannabis-science-and-medicine) offer lecture series on cannabis that can serve as a foundation to increase pharmacists’ knowledge base. TABLE 2 lists several helpful resources for health care providers. More than half of US states have laws in place regarding medical marijuana use, and marijuana use for medical indications is increasing. Thus, it is critical that health care providers understand federal law and its implications, as well as state laws where they practice. Pharmacists are in a prime position to assume a leadership position in educating patients and other health care providers on safe, appropriate use. Krenzelok EP. Marijuana legalization: a continuing conundrum. Am J Health-Syst Pharm. 2017;74(22):1843-1844. Struyk R. Marijuana legalization by the numbers. CNN Politics (March 30, 2018). www.cnn.com/2018/01/04/politics/marijuana-legalization-by-the-numbers/index.html. Accessed September 10, 2018. National Academies of Sciences, Engineering and Medicine. The health effects of cannabis and cannabinoids: the current state of evidence and recommendations for research. Washington, DC: The National Academies Press; 2017. Schauer GL, King BA, Bunnell RE, et al. Toking, vaping, and eating for health and fun: Marijuana Use Patterns in Adults, U.S. 2014. Am J Prevent Med. 2016;50(1):1-8. Bradford AC, Bradford WD, Abraham A, et al. Association between US state medical cannabis laws and opioid prescribing in the Medicare Part D population. J Am Med Assoc Intern Med. 2018;178(5):667-672. Boehnke KF, Litinas E, Clauw DJ. Medical cannabis use is associated with decreased opiate medication use in a retrospective cross-sectional survey of patients with chronic pain. J Pain. 2016;17(6):739-744. Lucas P. Rationale for cannabis-based interventions in the opioid overdose crisis. Harm Reduct J. 2017;14(1):58. doi: 10.1186/s12954-017-0183-9. Vyas MB, LeBaron VT, Gilson AM. The use of cannabis in response to the opioid crisis: A review of the literature. Nurs Outlook. 2018;66(1):56-65. The University of Mississippi. Marijuana Research. National Institute of Drug Abuse (NIDA) Contract. https://pharmacy.olemiss.edu/marijuana/nida-contract/ Accessed September 11, 2018. Winningham J, Testaberg A, Long J. The pharmacist’s role in emerging medical cannabis science: integrating medical cannabis into standard counseling protocol. America’s Pharmacist (November 1, 2017). NCPA Learning Center. Balick R. Pharmacists tread carefully into the world of medical cannabis. Pharmacy Today. January 2018;28-31. National Institute on Drug Abuse. Marijuana. https://www.drugabuse.gov/publications/drugfacts/marijuana. Accessed October 12, 2018. Allen JH, de Moore GM, Heddle R, et al. Cannabinoid hyperemesis: clinical hyperemesis in association with chronic cannabis use. Gut. 2004;53:1566-1570. Durkin M. Medical marijuana . . . in the hospital? As states legalize marijuana, hospitals develop policies on inpatient use. ACP Hospitalist. January 2017. https://acphospitalist.org/archives/2017/01/marijuana-policies-hospital.htm. Accessed September 10, 2018. The Joint Commission. Medication Management presentation by Valerie Henriques, MA, Med, RN, Joint Commission Clinical Surveyor (April 5, 2018). https://www.jointcommission.org/assets/1/6/Medication_Management_Presentation.pdf. Accessed October 12, 2018. Borgelt LM, Franson KL. Considerations for hospital policies regarding medical cannabis use. Hosp Pharm. 2017;52(2):89-90. Ashley E. Glode, PharmD, BCOP, graduated from Duquesne University School of Pharmacy in 2007 and is an assistant professor at the University of Colorado Skaggs School of Pharmacy and Pharmaceutical Sciences. She works in the outpatient phase of the I/GI/sarcoma/head and neck clinic, providing patient education and clinical consults for cancer patients receiving standard of care or study treatment. Ashley teaches at the School of Pharmacy, and her professional interests include the use of complementary and alternative medicine, the pharmacist’s role in optimizing supportive care, and patient education. In Colorado, the state constitution was amended in 2000 to allow patients with chronic, debilitating medical conditions the use of medical marijuana.1 However, medical marijuana use did not increase significantly until 2009, when the US Attorney General provided guidelines for federal prosecution of the possession and use of marijuana, relinquishing jurisdiction of marijuana law enforcement to state governments.2 In 2012, the state of Colorado legalized the retail sale, purchase, and possession of marijuana for state residents and visitors 21 and older.3 Dispensaries began selling to consumers on January 1, 2014. 4333d/64ac641c3db0a94f87256ffd006a49b5?OpenDocument. Accessed September 11, 2018. US Department of Justice, Office of Public Affairs. Attorney General Announces Formal Medical Marijuana Guidelines (October 19, 2009). www.justice.gov/opa/pr/attorney-general-announces-formal-medical-marijuana-guidelines. Accessed September 11, 2018. Colorado Amendment 64: Use and Regulation of Marijuana.www.fcgov.com/mmj/pdf/amendment64.pdf. Accessed September 11, 2018. Monte AA, Zane RD, Heard KJ. The implications of marijuana legalization in Colorado. J Am Med Assoc. 2015;313(3):241-242. Report_June_2018.pdf. Accessed September 10, 2018. Colorado Department of Public Health and Environment (CDPHE). Medical Marijuana Registry Caregivers. https://www.colorado.gov/pacific/cdphe/medical-marijuana-registry-caregivers. Accessed September 10, 2018. Monte; Baca R. Tests show THC content in marijuana edibles is inconsistent. Denver Post. March 8, 2014. www.denverpost.com/2014/03/08/tests-show-thc-content-in-marijuana-edibles-is-inconsistent/. Accessed September 11, 2018.